as seen in 4.10.17 article here. Ah, spring. For many, it’s the best time of year because it’s finally possible to spend some time in the great outdoors soaking up rays, smelling the new blooms, and enjoying the fact that you’re not freezing for the first time in months. Yet for allergy sufferers, spring’s refreshing greenery can trigger a less-than-fun seasonal transition plagued by bothersome and distracting symptoms. Not sure if allergies are the cause behind your sniffling? 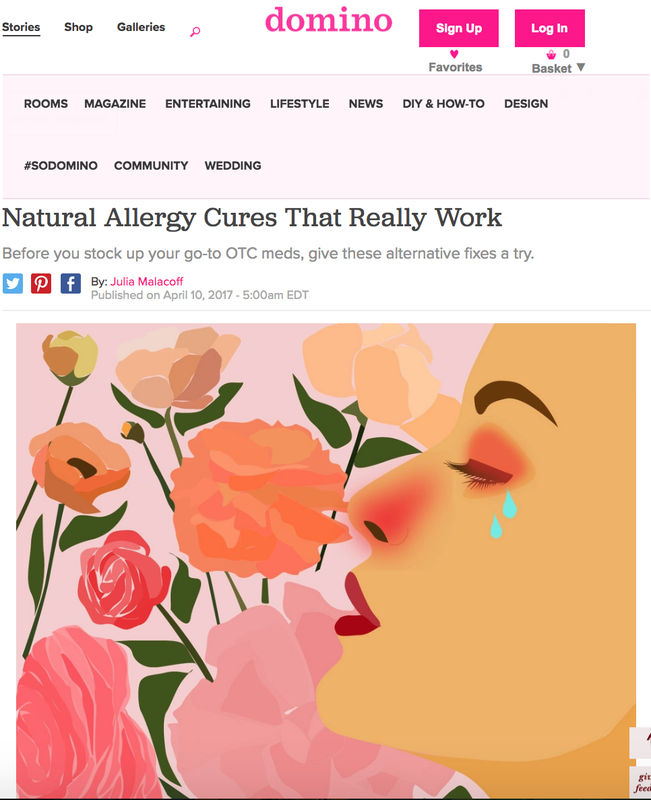 The most common symptoms of allergies, according to Dr. Gabrielle Francis, an NYC-based naturopathic doctor, are a runny nose, sinusitis, sneezing, itchy eyes, fatigue, brain fog, sore throat, and headaches. Usually, these symptoms occur in the spring or fall, especially around the weeks that seasons start to change. As for what causes them, “you may think that you’re predisposed to allergies because your parents have them, but allergies are also caused by a weakened immune system or compromised adrenal function,” she says. Because of that, there are some simple and totally natural methods you can use to stop them in their tracks, boost your immune system, and keep yourself feeling as fresh as a spring flower. In some cases, you can eat your way to feeling better. “Eat citrus fruits and dark-skinned berries for vitamin C, along with red, yellow, and orange veggies for vitamin C and vitamin A,” suggests Francis. Another natural remedy you can easily incorporate into your routine is adding one teaspoon daily of local organic honey, which Francis says is a natural allergy fighter. 2. Cut out common allergens. Seasonal allergies can be exacerbated by common allergens that increase inflammation. If you don’t already eat super clean, “eliminate all sugar, soft drinks, artificial sweeteners, wheat, gluten, and dairy products,” recommends Francis. Of course, everyone’s different and not everyone is gluten or lactose intolerant, but it’s worth testing out what happens when you remove them from your diet if you want to treat your allergies naturally. “Round out the diet with eight to ten glasses of water daily,” she adds. There are lots of supplements that can fight inflammation and give your immune system a little extra help. For starters, Francis suggests vitamin C, food-based antioxidant formulas, bioflavonoid formulas that include quercetin, rutin, and hesperidin, proteolytic enzymes formulas with bromelain, flaxseed oil, and a probiotic. As always, you should consult with a professional before you start any new supplement regime. There are so many health-related reasons you should sleep seven to nine hours per night, but this is especially true if you have allergies. “Optimal sleep is important to support healthy adrenal and immune function,” notes April Blake, ND, LM, a naturopathic doctor at OneMedical. 5. Exercise regularly, ideally indoors. Just as the habits of getting enough sleep and eating healthy can help lessen the symptoms of allergies, exercising regularly can also play a role in keeping up your defenses, according to Blake. If your normal workout routine is outside, it may be worth it to move it indoors during peak allergy season so you can avoid inhaling environmental allergens like pollen. 6. Don’t bring allergens into your home. Ideally, you want your home to be an allergen-free zone so that your symptoms don’t worsen at night. “Take a shower before bed to wash off pollen,” suggests Blake. You can also remove any shoes you wore outside when you come inside to avoid tracking pollen inside. Lastly, even though a cool breeze feels nice on a spring day, it’s best to keep your windows closed to keep allergens out. 7. Give acupuncture a go. If alternative medicine interests you, acupuncture treatments may be a good option. “In Chinese traditional medicine, we believe when a person has a history of seasonal allergies, their lungs are functioning improperly to defend the body of invaders,” explains Mona Dan, a leading acupuncturist and owner of Vie Healing in Beverly Hills. “We believe the lungs control the skin, and if the lungs are weak, your pores are more susceptible, allowing an allergic attack instead of fighting against it. Through acupuncture, the nervous system can relax, which helps it function optimally.” It might not work for everyone, but some people swear by it. 8. Try an immune-boosting smoothie. Mix the above ingredients into 12 to 16 ounces of purified water. You may add ½ cup of frozen organic fruit (you can add more, but watch the calories). Optional: add ½ cup yogurt or rice, almond, or soy milk. Of course, if these remedies aren’t working for you, it may be worth it to head to your doctor and get their take on your situation. “When allergies are causing problems with severe rashes, breathing problems such as asthma, insomnia, anxiety, or if the symptoms seem to be progressing into an infection with thick yellow mucous and fever, these are signs that the severity may be dangerous and progressing,” says Francis. Sometimes, prescription meds are needed, so if the natural methods aren’t enough to combat severe allergies, check in with a specialist ASAP.